Coberta do garanhão Gunner Dun It Again em 17/03/2019. Seu pai é CROMED OUT MERCEDES, U$ 146,645,00. Campeão NRBC Open. Res Campeão Mundial AQHA Rédeas Ab Jr, Res Campeão Reining By The Bay Open Derby, finalista NRHA Open Futurity e Derby. Seus filhos já ganharam mais de U$ 690 mil em Rédeas. Pai de: MZ MERCEDES WHIZ, U$ 110,152: Res Campeão NRHA Int Open Futurity; BENZ SMOKIN, U$ 37.793: NRHA Futurity 6o.L Int NP e Res Campeão Ltd NP; CROMED OUT GUNNER, U$ 32.298: NRHA Futurity Co-Campeão $50k Ltd Open e 7o.L Ltd Open; CURLY MI, U$ 26.584: Res Campeão Rocky Mtn Open Futurity. - WHIZ IN CHEX TPC, 34.5 pts. R$ 36.375,00 ANCR. 1°L. Derby 2014 de Rédeas ANCR Rédeas - Aberta ? Livre. - SPIN ZONE WHIZ, 19.5 pts. R$ 20.350,00 ANCR. 1°L. XXIII ANCR Derby de Rédeas Rédeas - Aberta ? Livre. - WIMPY CHEX WHIZ, 14 pts. R$ 14.375,00 ANCR. 1°L. Super Stakes ANCR 2014 Rédeas - Amador - 19 anos ou mais. - CUSTOM PISTOL ($254,867: NRHA Open Derby Champion; NRHA Open Futurity Reserve Champion; NRBC Open Derby Reserve Champion; Congress Open Futurity Co-Champion). 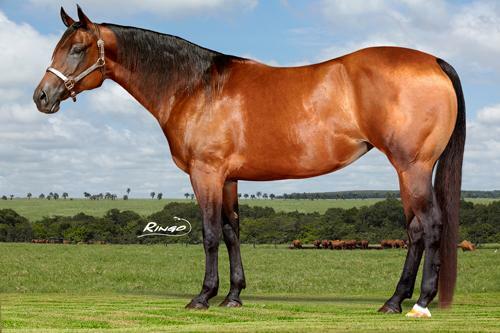 - CUSTOM LEGEND ($228,398 & 34 AQHA points: National Reining Breeders Classic Open Derby Champion; National Reining Breeders Classic Open Derby Reserve Champion; National Reining Breeders Classic Open Derby Co-Reserve Champion). - CUSTOM MAHOGANY ($200,338: NRHA Open Futurity Reserve Champion; 3rd, NRHA Open Derby). - CUSTOM RED BERRY ($183,374: AQHA World Champion Senior Reining Horse; NRHA Open Derby Champion; 3rd, NRHA Open Futurity). - CROMED OUT MERCEDES ($146,645: NRBC Open Champion; AQHA Reserve World Champion Junior Reining Horse). - CUSTOM HARLEY ($123,360: 4th,NRHA Intermediate Open Futurity). - CUSTOM CASH ADVANCE ($105,039: 3rd, 2010 NRHA Open Derby; top 10, 2011 NRBC Open Derby). Cactus Reining Classic Open Derby; Open Performance ROM. NRBC Limited Open Derby Champion, Reserve in the Prelim; 4th, NRBC Intermediate Open Derby; Amateur Superior Reining; Open ROM. Intermediate Non-Pro and Limited NonPro Derby; split 6th, 2011 Tulsa Reining Classic Intermediate Open Futurity. DOWNUNDER DIVA (f. by Topsail Whiz). Olena). $10,054: top 10, NRHA Intermediate Open Futurity. WHIZKEY ON THE ROCKS (c. by Top sail Whiz). $10,042: 2012 VA RHA Lim ited Open Futurity Champion, 3rd in the Intermediate Open. Champion, 3rd in the Intm Open; ROM. Open World Champion; Top Ten World Show; Superior Performance; NRHA money-earner ($71 000); ROM Performance.